Shuttle drivers play an integral role in serving our customers by transporting LTL freight overnight between service centers throughout our network. Because most shuttle drivers rarely have to touch the freight itself, your job is as simple as dropping, hooking and getting back on the road. Shuttle drivers enjoy daily hometime, while sleeper shuttle and team shuttle drivers are home weekly, which is more than just a little perk for a job like this one. Bring your co-driver with you OR we'll pair you with a compatible co-driver. With the option of even lower medical premiums if you participate in the upcoming year’s wellness initiatives. Red Thinkin’ Rewards- points program that encourages you to meet specific fuel & service goals and in return earn points towards a selection of over 12,000 gift items. 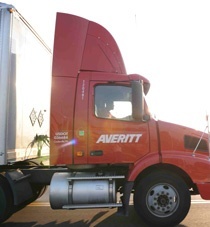 Averitt Express is an Equal Opportunity Employer. © 2019 Averitt Express, Inc.